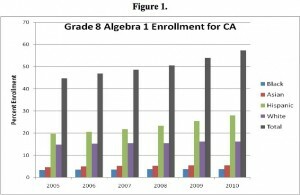 When it comes to flip-flopping, forget the Republican primary and take a look at California’s vacillation on when students should learn algebra. Yesterday, a year and a half after the State Board of Education adopted new math standards, researchers, educators, and policymakers once again sparred over the wisdom of requiring Algebra I for most eighth graders. When Phil Daro helped write California’s Common Core math standards, he was instructed to base them on evidence, not politics, and to take a close look at math education in the world’s top-performing countries. “What we saw, and what we learned, contradicts a lot of the assumptions on which California mathematics policy is built,” Daro told several hundred people attending Thursday’s Middle Grades Math conference at Stanford University. The most elemental difference, said Daro, who co-directs UC Berkeley’s Tools for Change, is that even though Algebra I is considered the single most important mathematics subject, California rushes students through it when they’re still in middle school, while high-achieving countries spread it out over three years. “We’re saying let’s spend less time on Algebra I, the most important math; it doesn’t make sense,” Daro said. Seated at a table in the back of the meeting room, farthest away from the speakers, some of the heaviest hitters in California education glanced at each other and exchanged a quick whisper. Algebra I is a can of worms they’d like to see buried beneath a massive compost pile, preferably in a neighboring state. More than a decade later, under pressure to comply with No Child Left Behind, the State Board of Education made Algebra I mandatory for eighth grade students. That led to a lawsuit, an injunction against the mandate, and flexibility for eighth graders to take Algebra I or an Algebra prep class. Then came Common Core, and California, in a preemptive move, adopted two sets of eighth grade math standards, pre-Algebra for the national standards, and Algebra I for the state. So it’s understandable if Daro’s recommendation to go more slowly to make sure that students fully comprehend the material – sound policy or not – didn’t elicit any huzzahs from policymakers at the meeting. The core reason for mandating Algebra I in eighth grade is equity and access for all to college prep courses. Supporters hoped it would stop the practice of tracking low-income and other underserved students away from the A-to-G classes required for admission to the University of California and California State University. But researchers at the meeting warned that the policy, as it’s being implemented, could backfire and make it harder for those students to be successful. There’s no doubt that it has achieved that goal. 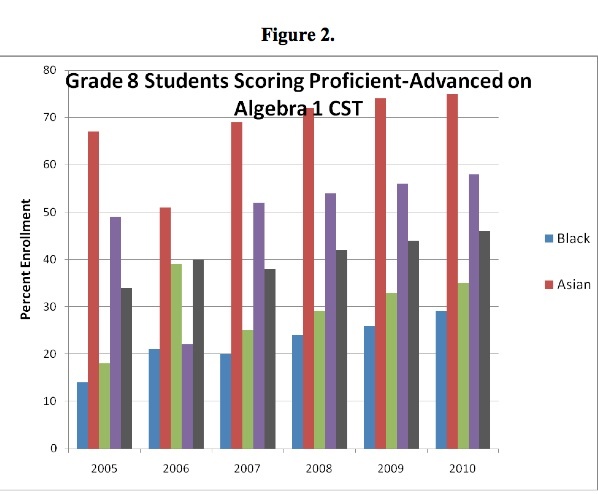 According to the SVEF report, the number of students taking Algebra I in eighth grade jumped by 80 percent between 2003 and 2010, with the most dramatic increase among low-income, African American, and Latino students. 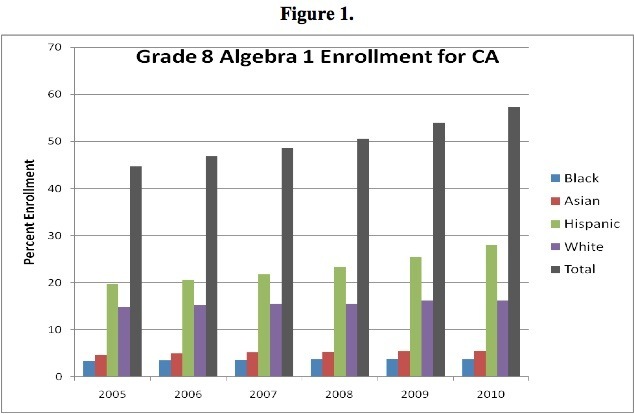 As that number rises, so too does the number of students reaching proficiency on the Algebra I California Standards Test. Nearly two times as many eighth graders met that bar, according to Algebra Policy in California, published by EdSource. Then the laws of physics kick in an there’s almost an equal and opposite reaction, with 1.5 times as many of the students scoring below or far below basic. Even though more eighth grade students are taking Algebra I, that doesn’t mean they’ve been equally prepared for it, said Neal Finkelstein, a senior research scientist at WestEd. 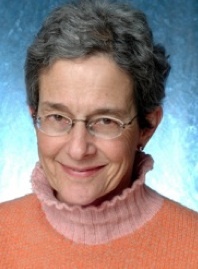 “There are many patterns of students who are not succeeding early, and are continuing to not succeed later,” said Finkelstein. EdSource researcher Matt Rosin wanted to know what the chances were of a student who scored basic or below on the seventh grade California Standards test being put in Algebra I. 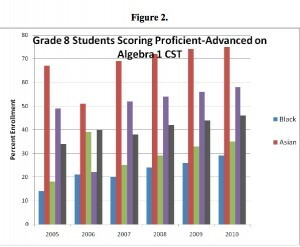 When he analyzed algebra placements and test scores for nearly 70,000 eighth graders during the 2008-09 school year, he found that compared to middle class schools, more students at low-income schools were placed in Algebra I, and more of them scored basic or below on that state test. Others would disagree that standards alone are the issue. During a conversation with Daro after the conference, former State Board of Education president Ted Mitchell said teacher preparation is a problem, especially in elementary schools. He would bring in math specialists to help out. Bruce Arnold seems to share that sentiment. He runs the Mathematics Diagnostic Testing Project at UC San Diego, where teachers learn to identify the specific reasons a student is having difficulty grasping a concept, and get ideas on how to teach that lesson differently. 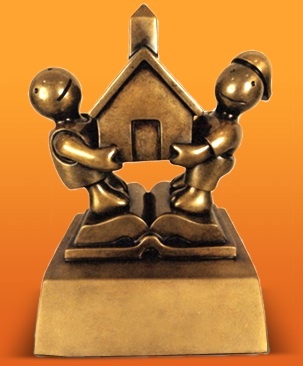 * TOP-Ed is an editorially independent project of the Silicon Valley Education Foundation. Students whose high schools don’t offer the required courses or enough sections to qualify them for admission to the University of California or California State University would have a right to take those courses online, under an initiative that sponsors are targeting for next November’s ballot. The California Student Bill of Rights would greatly expand high school online education, while breaking down geographic and other barriers that are denying many rural and urban students equal opportunities to attend a four-year public university. If their schools don’t offer AP history, or if calculus conflicts with their schedules, they could take the course through another publicly funded program. The initiative would also create a California Diploma for students who have accumulated the credits, known as A-G, for entry into UC or CSU, however and wherever they’ve taken the courses – in school, online, in one or more districts. Two leaders behind the initiative are administrators at Riverside Unified School District: Superintendent Rick Miller and David Haglund, principal of Riverside Virtual School, the largest district-run online school in the state. Both say they are acting as private individuals at this point, and the initiative’s web site doesn’t identify their affiliation. The online provider would be required to document student work, and students would have to pass a proctored end-of-year exam. The initiative would leave it to the state Department of Education to create regulations governing payments between providers and districts and verification of work performed. The provider of an online chemistry course could contract with the students’ home districts to offer the lab work and to proctor exams, for example. Haglund said he would propose tying tuition payments to online providers to student performance, as is being done in Florida. A quarter of the payment would be eligible only if a student got a C in the course; the final 25 percent should be tied to passage of the final exam, as determined by the state, he said. The initiative has been submitted to the Attorney General’s Office; signature gathering is expected to begin in December. 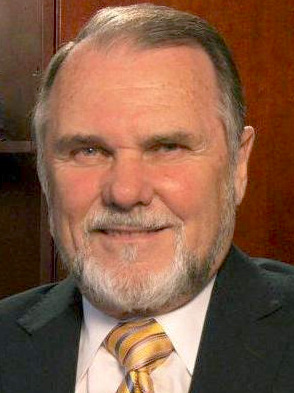 Haglund, who chairs Education Forward, the nonprofit organizing the initiative, won’t say who’ll fund it until checks start coming in, but he expects to receive support from education foundations and business executives in Orange County and Silicon Valley. He assumes he’ll be able to raise the $25 million needed to run a successful campaign. Riverside Virtual School serves about 115 full-time students, with between 2,500 and 3,200 students from Riverside Unified and other districts taking courses. But state restrictions on online providers have hindered online growth. California ranked last in a new rating of states’ openness to online learning by Digital Learning Now! 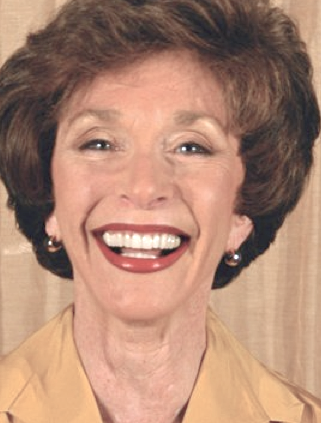 – a project of the Foundation for Excellence in Education, headed by former Florida Gov. Jeb Bush, and the Alliance for Excellent Education, a nonprofit headed by former Democratic Gov. Bob Wise of West Virginia. The Bill of Rights would push aside some obstacles, including a restriction that limits an online provider to offering courses only in the county in which it’s located and contiguous counties. Online providers aren’t automatically entitled to tuition for part-time students; they must negotiate payments with the students’ home districts. Full-time online schools are classified as independent study operations with strict student-teacher ratios. Haglund acknowledged that the initiative reflects frustration over failed efforts to amend restrictions on online learning, the latest being AB 802, sponsored by Assembymember Bob Blumenfield, a Democrat from San Fernando Valley. There will be another legislative effort next year. The Student Bill of Rights initiative “is not intended to be leverage (for passing a bill), but if it became leverage to get the Legislature to do the right thing, we would be happy with the outcome. This is just the first step,” Haglund said, to opening up online learning in California. California ACT scores exceed U.S. This year’s high school graduates from California outperformed the nation on the ACT, and on average are better prepared for college work, according to the annual report of the college entrance exam. But in the same breath, consider two qualifiers: Only a quarter of California high school students took the ACT, compared with 49 percent nationwide, so it’s a self-selected group; and, while improving, the nation’s test results aren’t a lot to brag about. In California, 30 percent of the Class of ’11 had high enough scores to be deemed ready for college in all four parts of the ACT exam: English, reading, math and science, compared with a record high 25 percent of students nationwide. 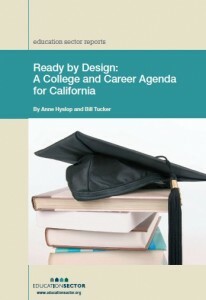 In 2007, 27 percent of California students were college ready in all four. ACT defines college ready as having at least 75 percent odds of getting a C and 50 percent chance of a B in a first-year college course at a two- or four-year college. 48 percent of California students met three or four of the college readiness benchmarks compared with only 40 percent nationwide. But 23 percent — nearly a quarter — were not ready for one college course, compared with 28 percent nationwide. The ACT is more popular in the Midwest and South than in the West and Northeast. While the number of ACT takers exceeded the SAT for the first time this year, in California, 99,000 students took the ACT while 211,000 took the SAT. The SAT scores won’t be available until next month, but the 2010 scores for California closely mirrored those of the nation, except for in writing, where California students did significantly better. ACT is becoming more popular in California, with a 60 percent increase in takers since 2007. During that time, Hispanics have registered the sharpest increase, rising from 21 percent of California test takers to 35 percent in four years. Both SAT and ACT are accepted by the University of California and California State University. The ACT is more of a curriculum-based test of high school knowledge. 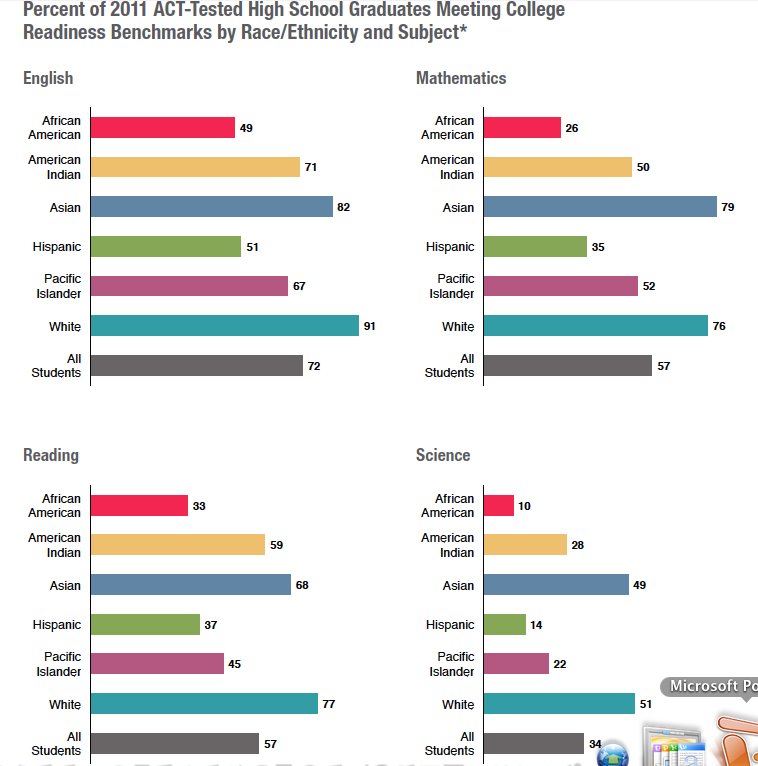 The disparities in achievements among ethnicities that start in early elementary grades not surprisingly follow the same patterns with the ACT (see chart). Only 10 percent of African-American and 26 percent of Hispanic Californians are college-ready in science, compared with 49 percent of Asians and 51 percent of White students. 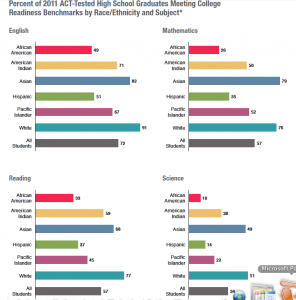 While 69 percent of White and 65 percent of Asian students have met three or four of the college-readiness benchmarks, only 19 percent of African-American and 25 percent of Hispanics have. ACT found that students who take what it calls a core curriculum – comparable to the A-G course load required for admission to a UC or CSU campus – are far more likely to be prepared for a post-secondary education. And it said that the best predictor of college readiness would be the level of achievement in middle school. “If students are to be ready for college or career when they graduate, their progress must be monitored closely so that deficiencies in foundational skills can be identified and remediated early, in upper elementary and middle school,” the report said. 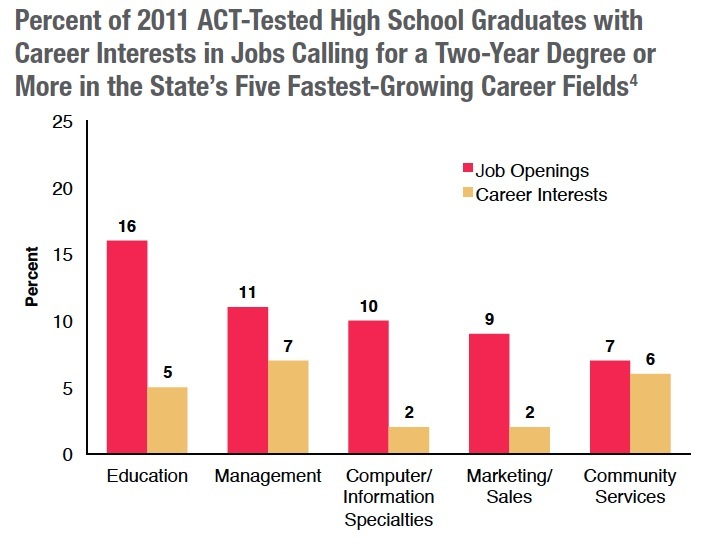 ACT also looked at the future job market and student aspirations and found an ominous disconnect in California, especially for Silicon Valley (see graph). California students' career interests appear out of sync with fast-growing job opportunities. Click to enlarge (source: ACT). 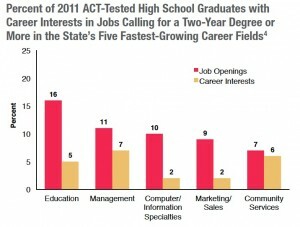 The five fastest growing careers in California demanding at least an associate’s degree will be, in order, education, management, computer/information specialties, marketing/sales and community services. Ten percent of new jobs by 2018 will be in the area of computer and information. But only 2 percent of students who took the ACT expressed interest in this field. Author John Fensterwald - Educated GuessPosted on August 18, 2011 August 19, 2011 Categories 10.1Assessments, A to G Curriculum7 Comments on California ACT scores exceed U.S. In 2002, ten African American and 39 Latino students enrolled and declared a Computer or Information Sciences major at all of the University of California schools. Six years later, eight African American and 25 Latino students graduated with that degree, according to UC’s office of the President. There is clearly an opportunity gap for students of color in computer science. In Silicon Valley, across California, and around the nation, there is a vast shortage of computer programmers in the tech industry. Tech companies have had to rely on outsourcing their programming needs. Meanwhile, high schools in California and across the country are being chastised for not preparing students, particularly students of color, to be able to major in STEM fields in college – what the need for outsourcing is blamed on. What if a simple change by the UC system could help bridge this gap? Recently, I took the introductory Rails for Zombies course for Ruby on Rails. Ruby, as it is known, is one of the newest and fastest growing programming languages on the web. I was a double major in college – biology and classical languages – and have always loved learning new languages. That’s all Ruby on Rails is, after all. There is unique vocabulary, confusing punctuation, and alien grammar. Ruby is replete with idioms, synonyms, and shortcuts that only those entrenched in the language understand. It is very much a foreign language. The UC system should be innovative and grant high school students credit for learning a computer language as their “E” requirement of 2 years of a “Language Other Than English.” All California high school students, in order to be “UC eligible” (a standard supported by most educators in California), must complete a series of courses at their high school deemed the “A-G” requirements. The UC approves high school courses to fit in each of the categories for individual high schools through a process that involves the submission of a detailed course syllabus by each school for each course. Statewide, only 35 percent of students complete a-g requirements upon graduation (by subgroup: Whites: 41 percent, Asians: 59 percent, Latinos: 26 percent, African Americans: 27 percent). I see the potential of affluent districts rushing to implement a policy such as this while lower-income districts struggle to find the resources (human and technological). In order to ensure that this is fairly and equitably implemented and to monitor its impact, begin it as a pilot program in high schools with the lowest percentages of A-G eligibility. In this way it can tackle three issues together: (1) opportunity and achievement gap; (2) increasing need for computer programmers; (3) the lack of diversity in the tech industry. Tech companies should then adopt districts and provide them with their slightly used computers expressly for the purpose of teaching computer science. They should also think about dedicating an employee to oversee the program and teach the courses. One teacher/tech employee can reach almost 200 students a year. If that’s not building a diverse pipeline in tech, I don’t know what is. Companies would probably need to release that employee only once or twice a week as online programming courses continue to pop up and the programmer could pop in to provide targeted guidance for the school and students and answer questions remotely. If I’m pushing 40 and can learn Ruby using an online course, I’m sure any 15-year-old can. Computer Science provides students with marketable skills other languages do not while still providing the same cognitive benefits of learning a foreign language. Empowered with computer science skills, students will see a path forward in college and career in one of the highest paying and fasting growing job sectors. 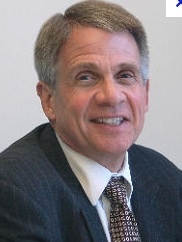 Robert Schwartz is the Executive Director of the Level Playing Field Institute, a San Francisco-based non-profit that promotes innovative approaches to education and the workplace by removing barriers to full participation by underrepresented groups. 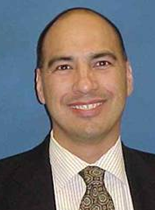 He spent the three years before that as Chief Academic Officer for ICEF Public Schools in South Los Angeles. Prior to that, Robert taught middle school science in East and South Los Angeles. He earned his EdD in Urban Educational Leadership from USC.